Aquiles Negrete has linked his name to a particular and charming field in science communication: narrative. He is a biologist, one of the first to bring in a classroom short stories as Nitrogen by Primo Levi and Crabs take Over the Island by Anatoly Dnieprov and test them as a reliable vehicle of knowledge for the students. 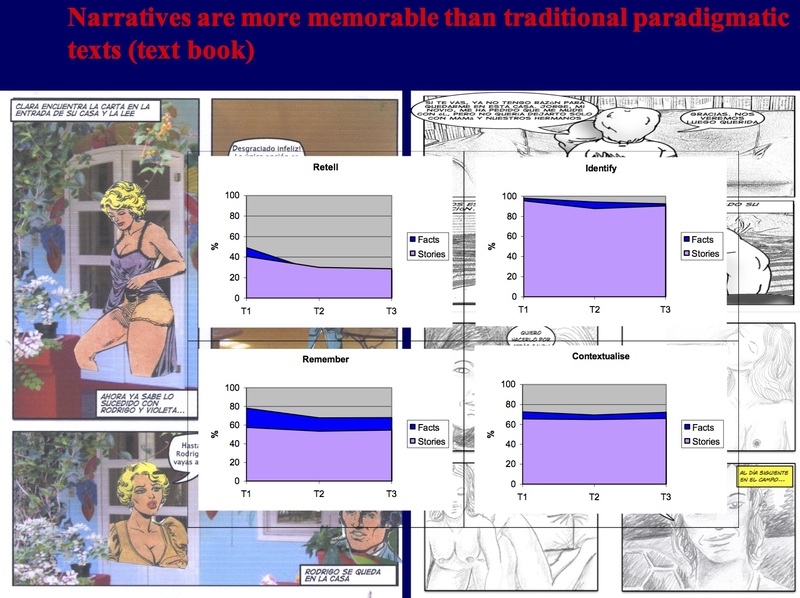 He has elaborated the RIRC method that compares narrative and paradigmatic ways of communicating scientific information, exploring their effectiveness by comparing memory (learning) for narrative and paradigmatic information. Negrete has written several academical article and books on the topic . He was at the EGU 2015 Earth sciences and Art Session to share his contribution to a particular and widely explored area in science narrative: comic strips. This case is about the use of it for conveying scientific environmental information to rural communities in Mexico in an understandable, memorable and enjoyable way. 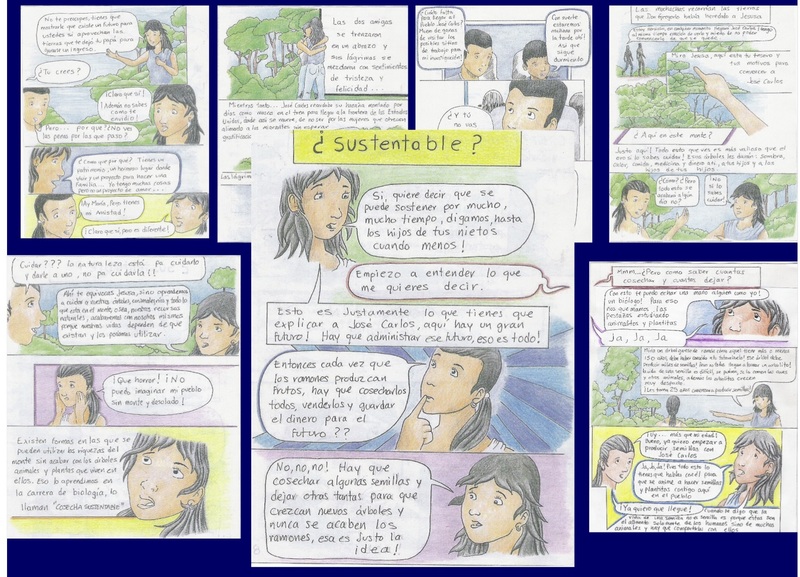 Starting from the Brundtland Comisión (1987) statement that sustainable development can be defined as “the capacity to resolve the present needs without compromising future generations possibilities to resolve their own needs”, Negrete realizes that comic strips is one of the most preferred media and is the main access to reading for millions of Mexicans. From “Libro Semanal” (Weekly book) and “Libro Vaquero” (Cowboy Book), more than half a million copies of each are sold every week and, on average, each copy is read by five individuals (together five million readers are reached by these publications per week). The two books combined, reach a printing of more than 40 million copies per year (López, 2003) placing them among the five weekly magazines with highest circulation in the country (Gutierrez, 2001). In the present case comic scrips serves the cause encouraging the sustainable use of Mayan Nut (brosium). The Brosium represents a food source for many human communities in south eastern Mexico. The seed of this tree is reach in fibre, calcium, potassium, folic acid and vitamin A and B. It represents an important source of proteins, due to the fact that its amino acid composition is very similar to the one of the meat. It is also a medical product. Hence it constitutes a social, economic and conservationist alternative for the production systems that now destroy our forests, because this tree produces big amounts of seeds without the need for deforestation, burning, pesticides, fertilization or irrigation; it protects the soil, water reservoirs and biodiversity; produces 4 times more food than corn per hectare and can be stored, contributing in this way to the food security. Comic strips were designed to address this message. • Help people to understand and remember scientific information for lengthier periods of time compared with traditional non-narrative texts. • To present science as it is developed including the emotions, errors and risks involved. • To provide the public with an interface to learn science in an accurate, trustworthy, enjoyable and in a dialogical way.